Flippin’ jelly! It sounds like a curse of sorts, doesn’t it? Maybe something you would say when the jelly you made doesn’t set up to the right consistency. 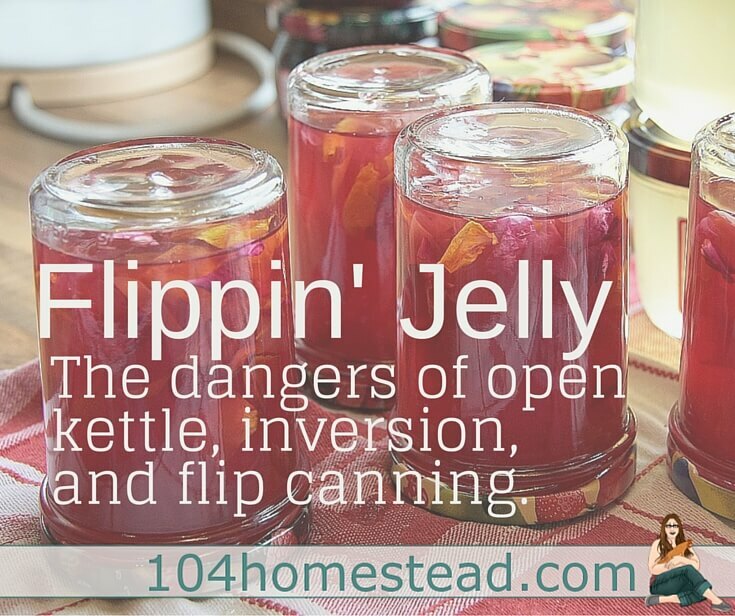 In fact, flipping jelly is an old-school canning technique that involves pouring very hot jellies or jams into jars, tightening the canning lid, and turning the cans upside down on a towel for 5 minutes or so. After the five minutes or so, you flip the jars right side up and allow them to cool and (in theory) ping. The fancy term for it is inversion canning. It’s also occasionally referred to as open kettle canning. Some things are great to pass down through the generations. Grandma’s world famous apple pie filling recipe is something to cherish. Some of her preservation techniques should, however, be left in the past. Times, they are a-changing. Inversion canning was a common method for preserving pickles, jams, jellies, applesauce, and even (shuddering) tomato sauces. 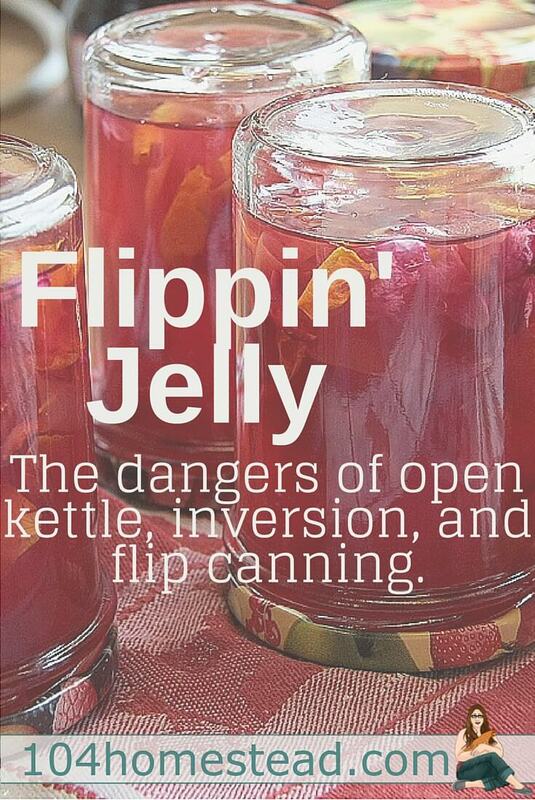 Why is jelly flipping canning dangerous? When jelly flipping/open kettle canning/inversion canning, food is cooked in an ordinary sauce pot, then packed into hot jars and sealed without processing. The temperatures obtained in the cooking process are not high enough to destroy all spoilage and food poisoning organisms that may be in the food. Also, microorganisms can enter the food when it is transferred from the sauce pot to the jars and cause spoilage. The scary part is that I am seeing on canning forums that people are forgetting steps like sterilizing jars first. Yes, you can forget to sterilize with water bath canning and it’s not the end of the world. The can is boiled for so long that it self-sterilizes. With inversion canning, it’s dangerous as heck. Can you identify food spoilage before it grows fur? See more about home canning safety. I worry about some of these people that are just getting started and they are starting with this method. Just because a lid “pops,” it doesn’t mean the contents inside the jar are safe. The time saved with open kettle canning is not worth the risk of food spoilage or illness. It should also be mentioned that today’s canning lids are not made to seal in this manner. They are made to vent under extreme heat. If you manage to heat your jelly and jam enough to kill all bacteria and micro-bacteria, the canning lid may cause the can to vent. Paraffin Wax Sealing involves pouring thin layers of wax over your jams and jellies until it is about 1/2″ thick. These wax seals do not remove the air in the can and frequently separate from the sides of the can, opening it up to bacteria. Steam Canning (not the same is pressure canning with steam) involves a small steamer that holds only an inch or so of water at the bottom. You put in your cans and close the lid and steam the cans. Unfortunately, the pressure doesn’t get strong enough to vacuum seal the cans and the temperatures don’t get high enough to sterilize. Aspirin Preservation involves adding aspirin tablets to low acid foods in the belief that they can be safely water bath canned instead of pressure canned. Oven Canning is something I am seeing way too much of lately. It involves using dry heat to can. There are two flaws with this. First, cans aren’t meant to be exposed to high levels of dry heat. There is a high risk of explosion. Second, dry heat takes an extremely long time to reach the middle of the can. The risk of the middle not getting hot enough to kill bacteria is too high. Do yourself a favor and get the Ball Blue Book: Guide to Preserving and always keep the newest edition on hand during your canning adventures. If you are ever in doubt about a canning method or practice, check with your local cooperative extension office. They are a valuable resource. Home » Real Food » Flippin’ Jelly! I only do the inversion canning with BlackBerry jelly. I don’t use pectin. I have not had any problems. I remember instructions in the pectin box that had you invert the jars for 5 minutes AFTER the water bath. Are you in the US? I haven’t seen those instructions on a box for years. “Ball Blue Book: Guide to Preserving” and “So Easy to Preserve” published by Cooperative Extension, The University of Georgia, are the two books I depend on for safe food preserving. They are both required reference material for the Hawaii Master Food Preservers program. They are filled with dependable techniques that have been tested and proven safe, even here on Kauaʻi, where bacteria and molds have a field day. We are required to maintain at most a 3.5 pH balance when using the hot water bath technique. Be safe. Get some testing strips and make sure you acid level is high enough for your area! Invest in a high quality pressure canner for the rest of your canning. This is NOT a place to try and save money. Give up something else if you have to. My grandmother planned on throwing away a certain amount of “bad” tomatoes sheʻd canned each season. Grandma didnʻt live in a time of super bacteria and resistant organisms. We do! Your familyʻs lives depend on your commitment to detail and safety. Form good habits and safe canning is a snap. I recently saw two methods used, that I hadn’t seen before, in YouTube videos. The first was lemon curd – they sanitized and heated the jars, poured in the curd, then put on the lids and rings. They then left the jars on the counter to cool and ‘seal’. He did say to refrigerate the jars, but also that they were good up until 7-9 months later? The second was nectarines in light syrup. The made the syrup (1 cup sugar to 3 cups water), brought it to boil, added the fruit andboiled until tender, then ladelled them into sterilized and heated jars. They removed any bubbles, then filled the jars to overflow it syrup! They put the sterilized lids on, allowing the syrup to overflow, then set then to cool and seal – no water bath or pressure canner. She said to remove the rings and wash and dry the jars after 2 hours, then to put in the pantry. I was very interested – and concerned – as both these methods were demonstrated on a TV show that had been loaded onto youtube. The first one doesn’t concern me too much. If it’s refrigerated, it should be fine. The second one is one of the old school methods that MAY be safe, but it’s not the safest option. People who should be using those techniques are people who really know what they are doing. If things are heated to the proper temperatures, bacteria can easily grow. I’d play it safe myself with water bath or pressure canning. I have a few recently published cookbooks with recipes for jam and jelly made with wax seals or inversion canning. It makes my skin crawl! I can because I want to feed my family healthy food, not give then botulism! Steam canning is considered safe now. The University of Wisconsin received a grant from the USDA and NCHFP to test atmospheric steam canning and was the process was approved the end of June 2015 for canning of high acid foods. Do you have a link for that? I heard rumor, but I haven’t been able to find information online about it. I have a copy of Putting Food By from 1971 (I think – very early 1970s, anyway), and THEY state that food storage specialists have been warning against open kettle canning for decades. 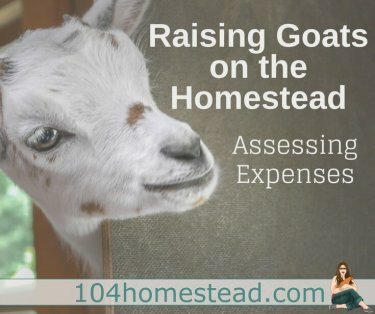 My grandparents had a pressure canner in the 1940s and THEY knew not to do this stuff because my grandmother read all of the pamphlets and books that the government happily handed out. So essentially, people who are still doing Open Kettle Canning are doing something that was known to be unsafe seventy years ago. And yet, they are still alive to keep doing it.